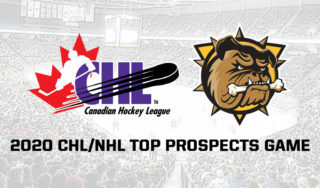 The 2019 Sherwin-Williams CHL/NHL Top Prospects Game will see some of hockey’s best future talents come together, a collection of 40 up-and-comers who share a common bond of elite-level skill, while a deeper look reveals the many bloodlines of this year’s competitors. In all, more than a dozen of the players have a family member involved in hockey, though no two prospects may be more prominent than Kelowna Rockets left-wing Nolan Foote (Team Cherry) and Barrie Colts centre Ryan Suzuki (Team Orr). Of course, it was only two years earlier at the 2017 Top Prospects Game in Quebec City when both players’ older brothers starred on the big stage as centre Nick Suzuki and blue-liner Cal Foote suited up for Team Cherry. In the NHL draft that followed, Suzuki went 13th overall to the newly-formed Vegas Golden Knights – he’s now a prospect with the Montreal Canadiens following a 2018 trade – while Foote, the son of former Colorado Avalanche legend Adam Foote, went one selection later when the Tampa Bay Lightning called his name with the 14th pick. Now two years later and the two elder brothers are inching closer to life in the NHL, as Suzuki is closing out his junior career with the Ontario Hockey League’s Guelph Storm, while Foote has been elevated to the minors with the Syracuse Crunch, the Lightning’s American Hockey League affiliate. Four sons from two families on the way to a life in hockey – so what’s the secret to their success? Or perhaps it’s as simple as budding players developing that early measuring stick and healthy competition that comes with a sibling rivalry. “Playing mini sticks in the basement or road hockey out on the street, I always gave him a good game,” Ryan Suzuki told the Canadian Hockey League in speaking about his 19-year-old brother Nick. “Having a guy like him pushing me, we were always competitive. It was definitely pretty special. As for Foote, his exposure into life in pro hockey started at an early age. After all, it becomes part of everyday life when your father is a cult hero helping guide the hometown Avalanche to multiple Stanley Cup championships. 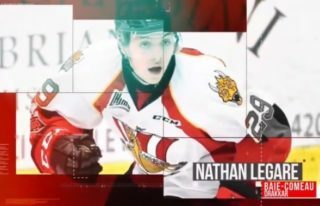 While Adam’s career gave Nolan and Cal a truly unique experience – what young hockey prodigy wouldn’t want to share Dad’s locker room with Hall of Famers like Patrick Roy, Joe Sakic, and Peter Forsberg? – the grizzled veteran has now taken his involvement to another level, as the first-year coach of the Rockets has become Nolan’s guiding voice in the Western Hockey League. While the prospect showcase is the latest opportunity for Suzuki, Foote, and their new teammates to put their skills on display, it’s also a benchmark along the way and a realization that the coming NHL draft is now just five months away. Both have received plenty of support on what to expect leading up to the big day. The Kelowna Rockets are pleased to announce the hiring of Adam Foote as the team’s new head coach. We’ll live stream Adam’s introduction at 11 am on our Facebook page. Nikita Alexandrov: While the budding forward is best known to fans of the Charlottetown Islanders, the Alexandrov name is well represented in his native Germany, where his father played pro, as well as stops in Russia and Norway. He also spent 69 games with the AHL’s Springfield Indians during the 1993-94 campaign. There’s also Alexandrov’s older brother Artjom, who has split time between Germany and Russia and is currently suiting up in Germany’s tier II league. Bowen Byram: The father of the Vancouver Giants defenseman dotted the hockey map with stints in eight pro leagues, including the AHL, IHL, and ECHL. His junior career from 1984 to 1988 saw stops with the Regina Pats and Prince Albert Raiders. Graeme Clarke: The Clarke family is preparing for the draft, but it may not be long before they do it all over again, as Graeme’s 15-year-old brother Brandt, a defenseman with the GTHL’s Don Mills Flyers, is eligible for the 2021 NHL Entry Draft. Joe Carroll: As the Sault Ste. Marie Greyhounds forward readies for life in the pro ranks, he can turn to cousin Patrick Killeen for advice. The 2008 draft pick by the Pittsburgh Penguins spent time in the AHL and ECHL before taking his pro career to Europe, where he’s currently stopping pucks for the EIHL’s Milton Keynes Lightning. Killeen played for the OHL’s Brampton Battalion from 2006 to 2010. Kirby Dach: Like Clarke, as Dach prepares for the draft, he’ll be able to offer advice of his own a few years down the road as 16-year-old brother Colton and 17-year-old cousin David, both playing in the Fort Saskatchewan Rangers program, capture the sights of scouts. Colten Ellis: The Rimouski Oceanic netminder isn’t the only member of his family focused on a career in hockey, as 16-year-old cousin Chase plays in Maritime Jr. A. He’s also suited up for seven games in the QMJHL this season after being selected by Drummondville in the 2018 draft. Meanwhile, Colten’s 16-year-old brother, Matthew, is in his second season of major midget with the Cape Breton West Islanders. Matvey Guskov: Much like Alexandrov, Guskov’s father Alexander is well known in Russia, as he suited up from 1994 to 2015, including a move to the KHL in 2008. His final season came in 2014-15 with the KHL’s Neftekhimik Nizhnekamsk. Thomas Harley: While the Mississauga Steelheads defenseman may end up playing hockey at the highest level, he can turn to father Brian, who played four seasons at the University of Alberta, and brother Stuart, currently playing tier III NCAA, for their thoughts on the game. Peyton Krebs: The Kootenay ICE captain isn’t the only member of his family suiting up in the WHL, as 19-year-old brother Dakota has spent four seasons in the league, splitting time between Tri-City and Calgary. Kaedan Korczak: The hockey lineage for the Korczak family begins with father Chad, who played at the collegiate level with Michigan Tech. He laid the groundwork for sons Kaedan and Ryder, the younger who is currently in his first season with the Hitmen. Samuel Poulin: Hockey fans in four markets will remember the Poulin family, as father Patrick played 634 NHL games split between Hartford, Chicago, Tampa Bay, and Montreal. The 1991-92 CHL Player of the Year spent his junior days with the QMJHL’s St. Hyacinthe Laser. As for Samuel, he’s also following in the footsteps of older brother Nicolas, who after four seasons with Sherbrooke is now skating at McGill University. Matthew Robertson: After brother Tyler spent four seasons with the Edmonton Oil Kings, which included a Memorial Cup championship in 2013-14, it only made sense for the franchise to select Matthew in the 2016 WHL Draft. Nick Robertson: Brother Jason is already on his way to life in the NHL after being selected in the second round by the Dallas Stars in 2017. He’s currently rounding out his junior career with Niagara after spending the past three seasons in Kingston. Oleg Zaytsev: Any questions in the lead up to draft day can be referred to older brother Egor, a defenseman with the KHL’s Moscow Dynamo who was drafted by the New Jersey Devils in 2017.